As soon as the planetary side of the drive was opened, the technician discovered that the gear oil had a very pungent scent. 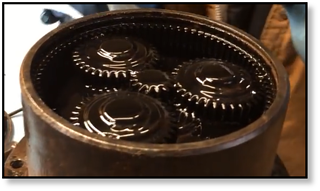 Although the drive had plenty of gear oil in it, the gear oil had not been changed in a very long time. In all likelihood it had degraded to the point of losing most of it beneficial properties. 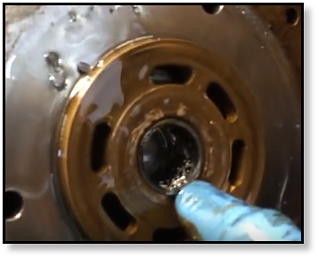 This alone can cause something wrong with your final drive that results in major damage. After disassembling the rest of the planetary side of the hydraulic drive (also referred to as the front section, gear hub, or gear section of a final drive), no further damage was evident. The parts would need to be thoroughly cleaned before a final judgment as to their condition could be made, but initial visual inspection did not reveal anything damaged seriously enough in this section to be the cause of final drive failure. The hubs were pressed apart to continue the inspection of the final drive hydraulic motor. The next issue discovered involved the face seals (aka, duo cone seals or main seals). The face seals, marked in the image by a red arrow, appeared to have worn out from normal use, having exceeded the number of hours they are rated for. Had the mini excavator hydraulic motor continued to be run with failing face seals, the gear oil would have leaked out and abrasive contaminants would have made their way into the planetary section and caused expensive damage. The valve block was then removed from the drive motor to provide access to the hydraulic side. This led to the discovery of a severely damaged needle bearing which in turn ate away at the lower shaft. You can see clearly see the damaged needle bearing in the image below. It was noted that the snap ring (or internal circlip or C-clip) had completely come out of its seated slot on the valve block. The snap ring serves to hold internal piston block spring in place. No reasonable explanation could be found for the snap ring doing this. As the inspection continued, the technician discovered that the valve plate had been damaged, as well as other serious damage to the rotator group. When the snap ring came out of the seated slot, the result was a devastating domino-effect. The internal piston block spring was allowed to rub across the valve block. The resulting debris caused by this most likely caused the damage seen with the needle bearing. It also resulting in a grooved, scratched swash plate and scarred piston shoes, which would seriously affect the performance of the final drive motor and lead to its failure. 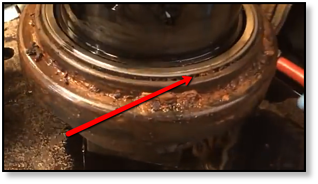 The Bobcat mini-excavator hydraulic motor that was sent in to Texas Final Drive for rebuilding had suffered major damage due to a snap ring that had somehow moved from its seated slot on the valve block. 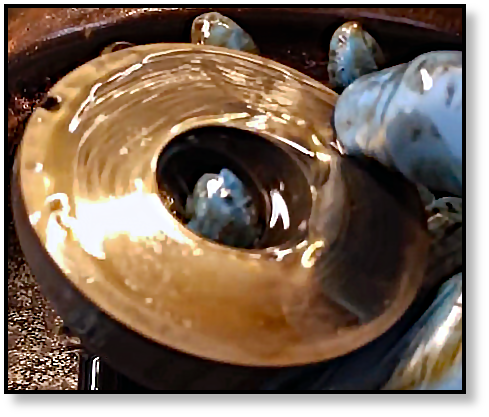 This resulted in a cascade of damage to the needle bearing, lower shaft, valve plate, swash plate, valve block, and piston shoes. Check out "Oscar's Dirty Job," "Down and Dirty Disassembly," and "Shayne's Art of Part Assembly" video clips in this new first-of-a-kind video eBook and get the BONUS Slide Deck as a further reference. Get it now!